Bottas was strong in qualifying, on provisional pole before just failing to match his team-mate's final lap, before acing his start in the race and storming to an advantage of more than 20 seconds at the chequered flag. It doesn't get much more dominant than that. Not only did Verstappen out-qualify a Ferrari on Saturday, the Dutchman then sensationally overtook Vettel in the race before closing up to within a second of Hamilton's Mercedes. What was even more striking was that Verstappen was carrying this new partnership alone, with his team-mate well down the field. He can handle that pressure. Vettel made his mistakes last year, but his team must take the blame here. Indeed, you suspect Vettel extracted the maximum out of this under-performing package as he beat his new team-mate in qualifying - where he was still 0.7s off the Mercedes - and in the first half of the race as he kept up with Hamilton. But then Vettel started to tread water. Haas have laid down their marker as the team to beat in midfield, led by the impressive Kevin Magnussen. Beaten by his team-mate in qualifying, the Dane promptly took sixth off Romain Grosjean into Turn One and then never looked back. The Finn was verging on excellent in Australia, a racing mile of his young team-mate in qualifying and neat and tidy in the race to take comforting points. Kimi being Kimi downplayed it all afterwards, complaining of a comprised race strategy after a visor tear-off flew into a braking duct, but this was a very satisfying result all-round. Evidence that Daniil Kvyat should never have been dropped? The Russian would have been disappointed to lose out to rookie team-mate Alex Albon on Saturday but shone in the race - only making one small error when attacking Stroll - before admirably keeping Gasly at bay. Perhaps he thinks he should be the one in that Red Bull. Sergio Perez did extremely well to make it through to Q3 on Saturday but in truth, he never appeared comfortable in his Racing Point all weekend - claiming the upgrades weren't working expected and lacking balance. Usually so strong in the race, Perez claimed it was "impossible to overtake" on Sunday and was surprisingly outshone by his new team-mate. 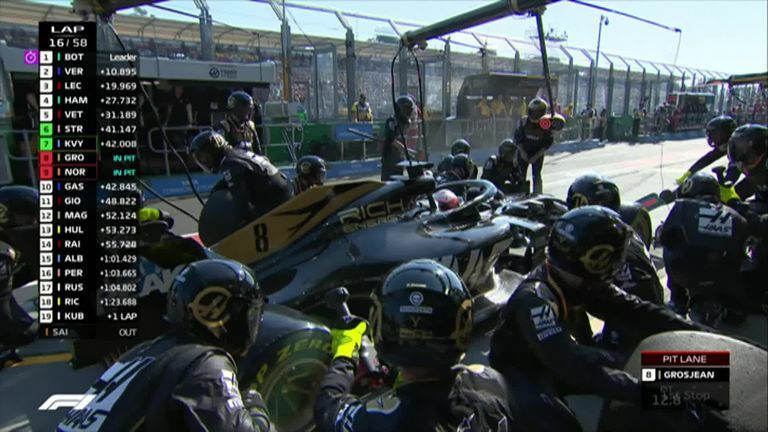 Romain Grosjean loses precious time in the pits after a Haas error. That must have hurt Daniel Ricciardo. After all the hype, after all the focus, the home favourite lost out to his team-mate in qualifying as neither Renault driver made it through to Q3, then lost his front-wing before Turn One on race day and retired before the grand prix had reached the halfway stage. 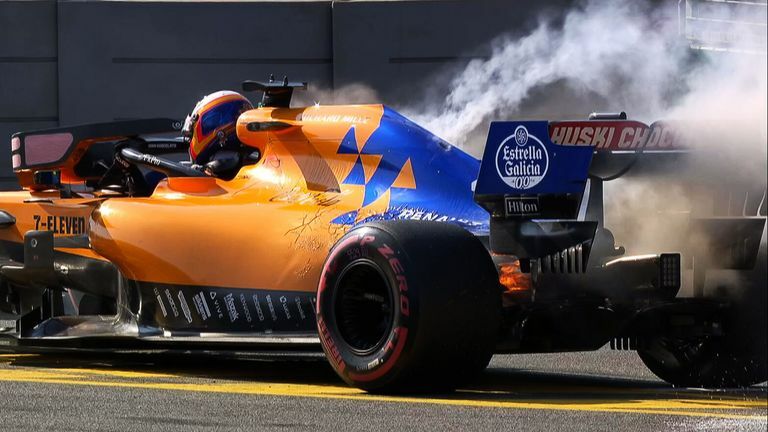 Watch the first retirement of the F1 2019 season, a puff of smoke out of the back of Carlos Sainz's car. Carlos Sainz's weekend in Melbourne was a luckless affair. His early exit from qualifying was a result of backing off when Robert Kubica crashed and he was within five seconds of team-mate Norris when his engine blew on lap 10. "It's been a weekend to forget," he succinctly summarised. "This one hurts."